St. Paul, Minn., April 25, 2014 PolyMet Mining Corp. (PolyMet or the Company) TSX: POM; NYSE MKT: PLM today reported that it has filed its financial results for the year ended January 31, 2014. PolyMet controls 100% of the development-stage NorthMet copper-nickel-precious metals ore-body and the nearby Erie Plant, located near Hoyt Lakes in the established mining district of the Mesabi Iron Range in northeastern Minnesota. The financial statements have been filed atwww.polymetmining.com and on SEDAR and EDGAR and have been prepared in accordance with International Financial Reporting Standards (“IFRS”). All amounts are in U.S. funds. Copies can be obtained free of charge by contacting the Corporate Secretary at First Canadian Place, 100 King Street West, Suite 5700, Toronto, Ontario M5X 1C7 or by e-mail at info@polymetmining.com. Earlier today, PolyMet announced the term of the convertible debentures originally issued in 2008 to Glencore AG, a wholly owned subsidiary of Glencore Xstrata plc (“Glencore”), had been extended for one year to September 30, 2015 (previously due September 30, 2014). 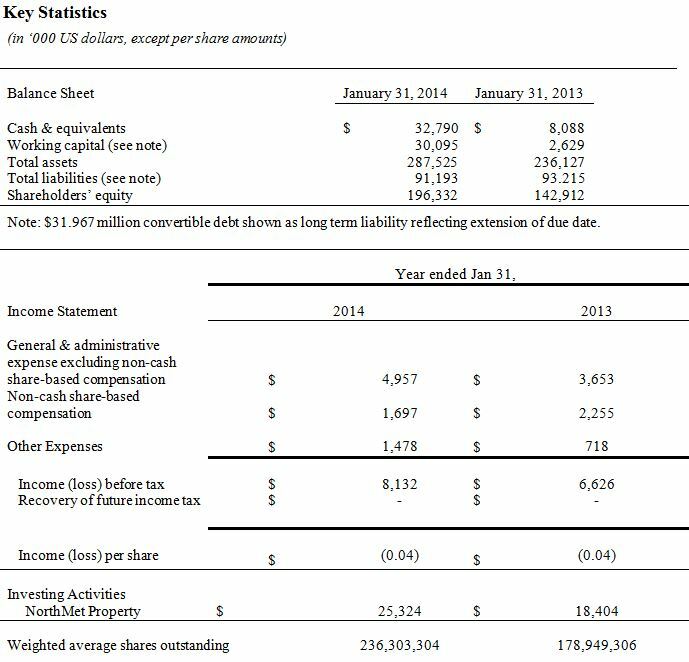 Loss for the year ended January 31, 2014 was $8.132 million compared with $6.626 million for the prior year period. General and administrative expenses excluding non-cash stock-based compensation in the year ended January 31, 2014 were $4.957 million compared with $3.653 million in the prior year period, excluding non-cash stock based compensation. Shareholder, investor and public relations expenditures increased to $2.075 million from $0.571 million in the prior year period largely owing to increased public relations activities associated with the supplemental draft Environmental Impact Statement and investor relations activity associated with the $60.5 million rights offering completed in July 2013. At January 31, 2014 PolyMet had cash and cash equivalents of $32.790 million compared with $8.088 million at January 31, 2013. PolyMet invested $25.324 million into its NorthMet Project during the year ended January 31, 2014, compared with $18.404 million in the prior year period, which included $2.092 million for purchase of wetland restoration properties. On April 25, 2014 PolyMet and Glencore, agreed (subject to approval of listing the additional shares from the NYSE MKT and the Toronto Stock Exchange) to extend the maturity of the convertible debt by up to a year to the earlier of the Early Maturity Event (receipt of permits necessary to start construction of the NorthMet Project and availability of senior construction finance, in a form reasonably acceptable to Glencore) and September 30, 2015 from the earlier of the Early Maturity Event and September 30, 2014. As such, $31.967 million convertible debentures, which were a current liability at January 31, 2014, are now a long-term liability. PolyMet can trigger conversion of the debt to equity upon the Early Maturity Event. As of January 31, 2014 PolyMet had spent $68.357 million on environmental review and permitting, of which $61.866 million has been spent since the NorthMet project moved from exploration to development stage. Specific reference is made to PolyMet’s most recent Annual Report on Form 20-F for the fiscal year ended January 31, 2014 and in our other filings with Canadian securities authorities and the U.S. Securities and Exchange Commission for a discussion of some of the risk factors and other considerations underlying forward-looking statements.